James Dean mesmerises in a layered and memorabel role, but cannot cover up the movie’s flaws. Rebel Without a Cause is iconic for its subtext, contemporary themes and poetic dialogue but as a movie feels inconsistent and, honestly, just bad. Banging on the walls of classic filmmaking, Rebel Without a Cause really isn’t that great. The camera twists and turns as if without direction. The sound editing is unnecessarily distracting. Anyone who loved the early naughties soap opera, The O.C., can surely appreciate the story beats, though they somehow don’t work in their original, ostensibly legendary, setting. The movie randomly crosses genres, from quiet personal drama to over the top car races and long police chases. Some of the smaller beats set up and pay off nicely, but the major plot points are dropped like bombs only to ignore the blast. Especially the climax feels out of place, with gun shots, suspense falling flat and characters running around aimlessly. Though with this wacky story there’s also a sense of unpredictability that excites in moments like the knife fight or the empty pool chase. It’s a movie that should’ve been better in most places, oddly works great in others, and is noticeable for a lack of moral and purpose, though perhaps ingeniously, that was exactly the point. 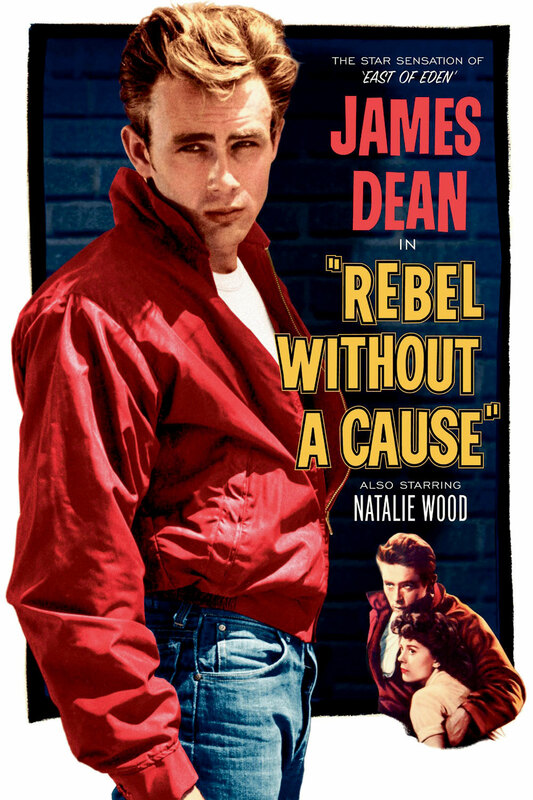 After all, it is titled Rebel Without a Cause and it captures something real and quiet about the struggles in civilised society; the wasteland of repressed and misunderstood adolescence, while looking for masculinity and meaning. Modern audiences would acknowledge this to be a #firstworldproblem, especially considering cinema has more than covered white male anxiety since 1955, but Rebel certainly offers a grounded, unequaled complexity to the restlessness of a spoiled generation. Contemporary as ever, James Deans Jim Stark, feels smothered by his loving mother, who bakes eggs for him in the morning, and abandoned by his obedient father who doesn’t dare to cross his wife. In an unfortunate, outdated, disregard of feminism, Jim suggest his father should hit his mother, thinking that might make her happy. Yet, it’s exactly this on-the-nose dialogue that works wonders here. The parental roles in the movie are fleshed out precariously to embolden the protagonists struggles. Dean materialises the often intended anxiously vague dialogue into clear internal struggle. The turmoil of his character is palpable, driving some of the best speechless moments in the movie. As the world has only gotten more intelligent and smaller, the void that is left by sophistication still screams at those lucky enough to encounter it, especially when they don’t accept it. The most prominent response is still to rebel, though today there are plentiful causes to project that same anxiety on. Where the movie hits high notes is in the quietness of two people talking. Whether it’s the back-and-forth between Jim and Judy (a character so stereotypical and fickle even Natalie Wood can’t fix her), which borders on philosophical, if not pretentious, or the sublime conversation that reveals some personality in designated jerk Buzz (Corey Allen), the script echoes the grandeur, existential and epic conversations you can only have when you’re young. The movie goes all out when it addresses the end of the world, and why shouldn’t it? Exactly this urgency and sensation stimulates the clueless actions that set off the movie. The opening with Jim, Judy and Plato (Sal Mineo in all his iconic glory) crossing paths at the police station is the delicious embodiment of teen angst. But not even the lyrical lines or Deans admirable play can outshine the gay subtext of the movie. Whatever transpired behind the scenes, on screen there’s unparalleled beauty in the love story between Jim and Plato. Not just because it rounds out his relationship with Judy, giving them the illusion of family they all desperately crave and need. But also because director Nicholas Ray flat out lets Mineo gaze upon Dean, while Plato invites Jim to his house to stay the night. Again, this is testament to the movie’s attempt to showcase internal conflict as outright as possible. Dean reportedly suggesting Mineo looking at him the way he looked at Wood is stuff of legends and it works like magic. Not only is Plato’s sexuality more emotional and sensual just beneath the surface, the dynamic between the three lead characters is refreshing and honestly unique. Taking in that Judy has no real personality of her own, rather only reacting to the men in her life when it suits the plot, there is still beauty in the scenes where the three mess around or quietly talk in the abandoned house. The ending, however, is uncalled for and somewhat diminishes everything the talents behind the movie tried to do up until then. Rebel Without a Cause doesn’t have a moralistic story or works particularly well as entertainment, but it highlights that movies can be partially great even when the sum is not. Its male leads act so over-the-top and yet so emotionally resonant, that they rightfully turned into legends. Its social aspiration to induce queer desire in film birthed wonderful, memorable moments. Its dialogue is literal and beautiful all at once. And damn if its themes of teen angst bar the test of time, for as long as man grows more civil, the rebel in all of us will continue to look for a cause.